Meet with VNC at NWFA! Vermont Natural Coatings is leaving the Northeast Kingdom’s wintry green mountains and heading to sunny Arizona this April! Join the Vermont Natural Coatings team at the NWFA Expo from April 12-13 at Booth #701 at the Phoenix Convention Center as we exhibit our Norton Abrasives|Vermont Natural Coatings PolyWhey® Professional Wood Floor Finishes. Add our demo theater presentation on Wednesday, April 12 at 1:00 pm to your schedule, when the newest Vermont Natural Coatings innovation comes to life. 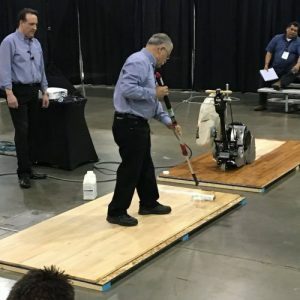 Technical education experts Greg Mihaich (Norton Abrasives) and Bob Goldstein (Vermont Natural Coatings) will take the stage to showcase the new addition to the PolyWhey Professional Wood Floor Finish line and you won’t want to miss it. Also on display will be our durable and safe topcoats, PolyWhey® 3500 and PolyWhey 2500., our easy-to-use sealer PolyWhey 3000, as well as PolyWhey Amber Sealer, Deep Cleaner and MVP Sport Floor Finish. You’ll also want to make sure to stop by the booth to see our newest innovations. Can’t attend the show but interested in learning more? Contact us at info@vermontnaturalcoatings.com or 802-472-8700.